Whilst I was helping to run a prayer space recently I was given these three stickers. 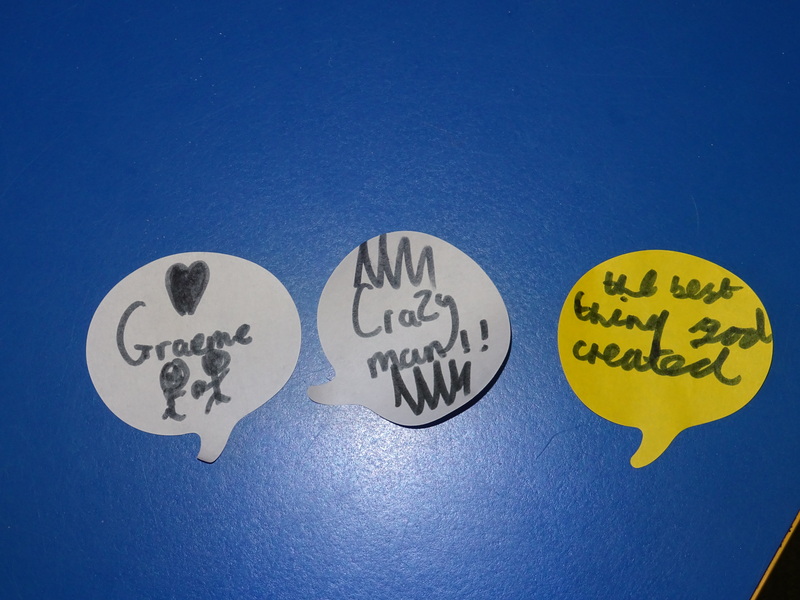 It started with someone giving me the one that says Graeme and this was closely followed by my daughter giving me the crazy man label. A few moments later, one of the children from the school in which we were running the prayer space gave me the third sticker which says ‘the best thing God created’. This young girl saw that I had been given a sticker that appeared negative and this inspired her to say something positive. Her actions were so kind and they encouraged me immensely. My only regret was that I didn’t think to offer her the sticker back to reinforce her self-worth because I believe that we are all the best thing that God created. We all wear labels that define us. Some of these labels are descriptive of our circumstances. For example I am a husband, father and church leader. Other labels are things that can stick to us if spoken to us enough times, even if we know that those labels aren’t true. Perhaps we have come to believe that we are ugly, worthless, stupid or hopeless and these or perhaps other negative words are things that we believe define us and that shape our everyday lives and experiences. Labels can also be positive and perhaps we have come to believe that we are creative, clever, beautiful, generous, kind or encouraging. Perhaps these or other positive words are things that we believe define us and that have a real impact on our everyday lives. How will we choose to label others today? Will we speak positive blessings over each other or will we stab people in the back with negativity? If we are put in a position where we are forced to criticize people, we can choose to do this in a positive way that shows people who they have the potential to be or in a negative way that causes someone the maximum amount of pain. Constructive criticism is always specific, ‘if you could have added this it would have been even better’ and in contrast negativity is always general ‘it was just no good’, ‘you can’t do it’, ‘you really are hopeless’. So, how will we choose to label others today? Will we speak positive blessings over each other or will we stab people in the back with negativity? I hope and pray that we can all look for opportunities to bless and to encourage the people around us by speaking positive truths to them. The Bible encourages us to build one another up and I hope that we can make this a priority. If you want to think further about these issues then I would suggest reading Stop calling him Doubting Thomas, God doesn’t like it! or My Greatest Creation is You. This entry was posted in encouragement, Everyone is valuable, Faith, Life experiences, Loving one another, self worth, Treat one another the way you want to be treated and tagged building one another up, building up or tearing down, don't label people, encourage, encourage one another, encouragement, everyone is valuable, label jars not people, life experiences, love one another, one anothering, our value comes from God and not what we do, tell someone what they mean to you, treat one another well, who can you encourage?, words hurt, you are valuable. Bookmark the permalink.